STATEMENT: For me, Art is a journey of discovery, and behind every discovery is a rewarding pleasure. This gets me more engaged in my work. Each time I find myself happy with the results, I try a bit harder. I find this approach more satisfying than sitting and wondering if the painting is good or bad. Of course, sometimes it works and other times you try and try but cannot capture your inner feelings. Then all I do is move on to another piece and do the same. Such is Art and Artists, a journey of discovering yourself each time you pick up a brush. If you do what you really like and do it from your heart, it doesn’t matter what the critic says because you know better about what you are doing than anybody else. I wish all art buyers and collectors to share with me this journey of discovery. ABOUT: Ali is a prolific Artist who has been painting for the last four decades. Much of his interest lies in abstract and expressionism. 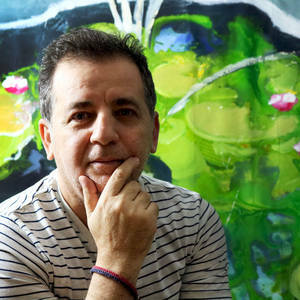 Having exhibited and sold art in Dubai, Kuwait, Lebanon, Saudi Arabia, London and America, Ali currently works and lives in London. He can be found at 501 Wimbledon Art Studios and sells his work through his website, online art galleries and open studio exhibitions. Dunstable College of Art from 1978/1980.